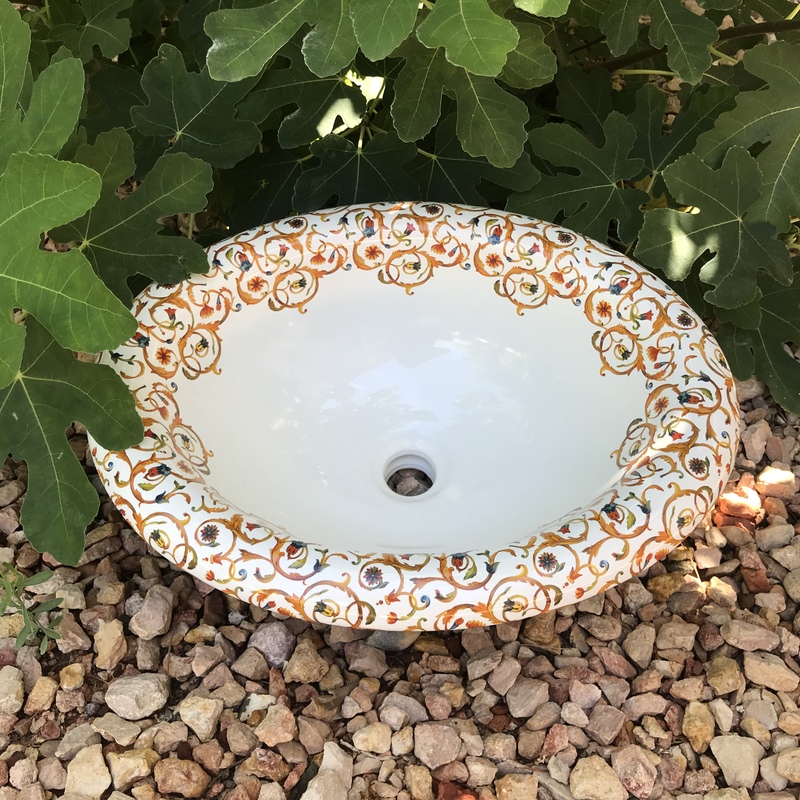 It’s really weird how designs cycle through popularity, I didn’t make any Florentine sinks last year, and in the last few months, I’ve made 3 already. I started taking photos of sinks in the garden (mostly for Instagram) so I didn’t have to do all that work in Photoshop beforehand. The Florentine design is an Italian classic, composed of ornate swirls, swashes and abstract flowers and leaves. The colors range from light and bright blue, yellow, orange, and red, accented with real gold. 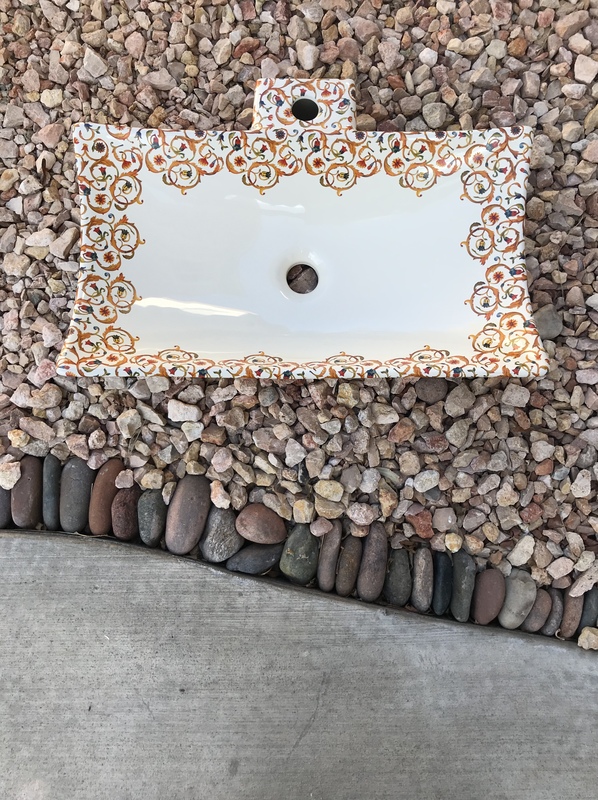 It’s just one of the many painted and decorated sinks I make, by hand and to order, here in Henderson, Nevada and available for sale on the website, decoratedbathroom.com. 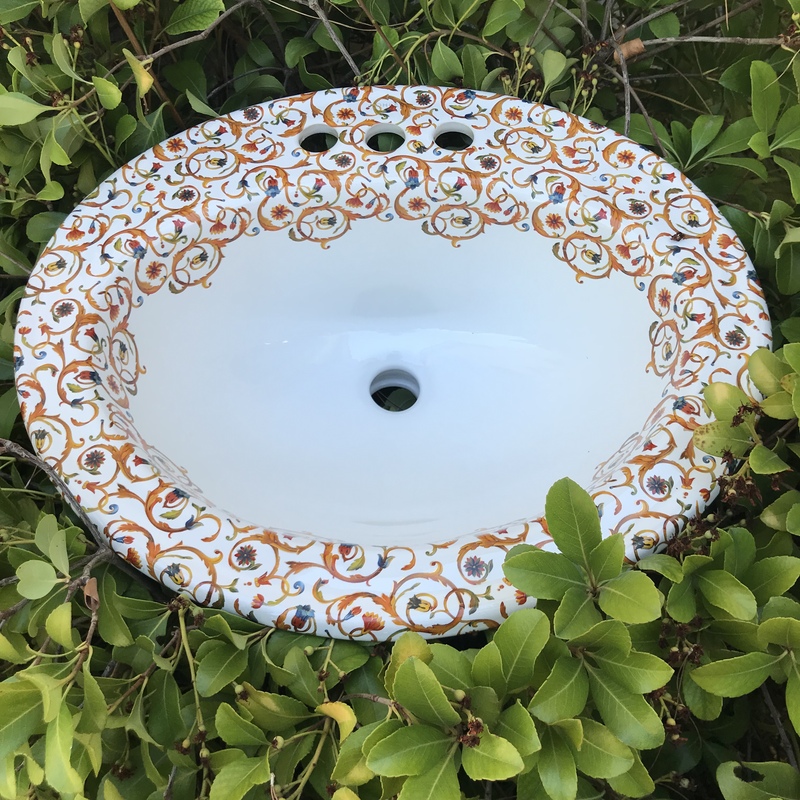 Florentine design painted on a drop-in sink with a big rounded rim. This shot is in the garden and the sink looks really good with the rocks and fig leaves. The design fits perfectly on the 19-1/2 x15-3/8″ drop-in bathroom sink. 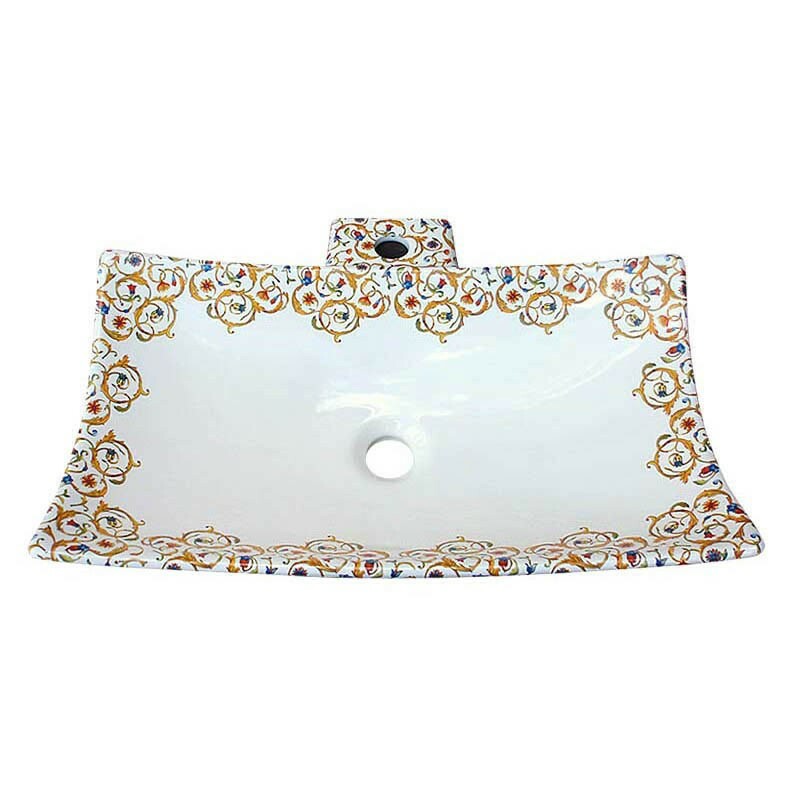 The raised rounded rim creates a great space to highlight the decoration on the basin. I especially liked this version because it combines the classic design with a more modern sink. I thought it worked really well. Of course, made by me, by hand in the USA and available on the website, Florentine Oval Drop-in, in white or biscuit. Florentine design painted on a Kohler Pennington Drop-in. Here’s another sink in the garden. I think I got a bit carried away on my Instagram feed with these ‘sink in garden’ shots, but they do look lovely and are easy to take. This customer just wanted to replace her sink in the existing counter and not have to cut a new hole. So the go-to option for those situations is usually the Kohler Pennington. It’s their standard drop-in sink, with a good shape and adequate basin size, and the advantage is that it has a large rim on it so there is a lot of leeway for the size of the hole in the counter. It’s not on the website, but it’s based on the Florentine Scalloped design. BTW I just replaced the builders sinks in my own 20-year-old-house in Las Vegas, and I wanted a new Quartz counter, but I bought my house when the prices were high so putting even more money into it, blah, blah, blah, (some stuff you have to do) so I kept the old counter and the Penningtons slotted right into the existing holes, no mess (getting a new counter), no fuss. They look great. I’m going to do a blog post on it when I finally get the bathroom finished. Florentine design painted on a contemporary slab vessel sink in biscuit. This is another variation of the design. A customer wanted a vessel sink and this one fit the bill perfectly. The flattish shape makes a great space to display the ornate scrolls, flowers and swashes. I really like the way it looks with the rocks in my garden and the piece of my new patio with river rock trim. I had all the rock left over from the previous incarnation of the garden (pre-patio) and as much as I DO NOT LIKE rocks, the river rocks are the best of the worst. I love the way they edge the patio. Another thing not quite finished, I have about half of it done. Anyways, the sink looks pretty good like that. It was one of the first photos I took for Instagram, just another social media task I need to perform. I want to start using the hashtag #ihatesocialmedia but I checked it and just looks like a bunch or people you wouldn’t want associated with your business. Really. It’s so much work and to a business like mine, death if you don’t do it. Florentine design on the front and back of the sink. You can see on these alternate views that the sink is decorated all the way around, and underneath. Lots of extra work for me but the end result is worth it. You can also see my hand, obviously no manicures for this lady, and the gold decoratedbathroom logo. The is one of the few sinks I can put it on where it looks pretty. Otherwise, I put them underneath the sink, ie under the counter, so that I don’t inflict a logo on my customers since logos on sinks are a big PIA for me. Kohler? and a whole bunch of other little companies, with names that no one knows, who wants that on their bathroom sink? Certainly not me. Thankfully, Creations by Alno Inc, who make the Bates & Bates sinks I use for oh so many of my designs, don’t put anything on theirs, just a lovely glaze for me to work on. 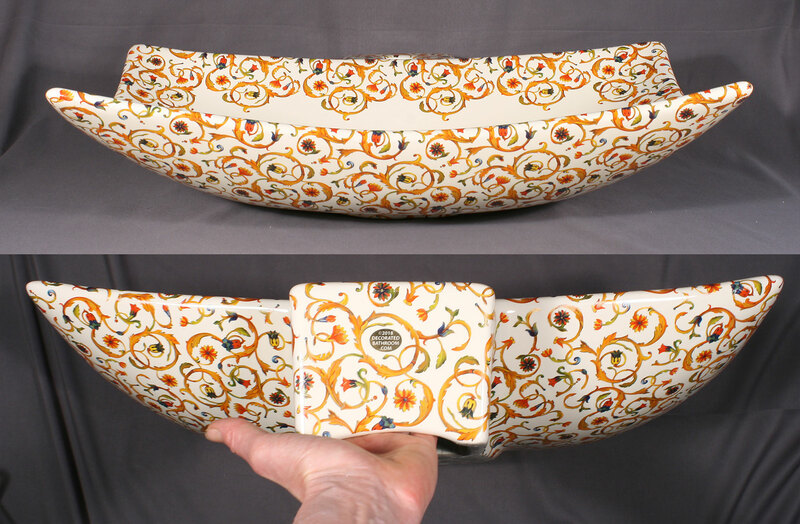 Here is the actual sink on the website, Florentine Slab Vessel, looks great on white or biscuit. 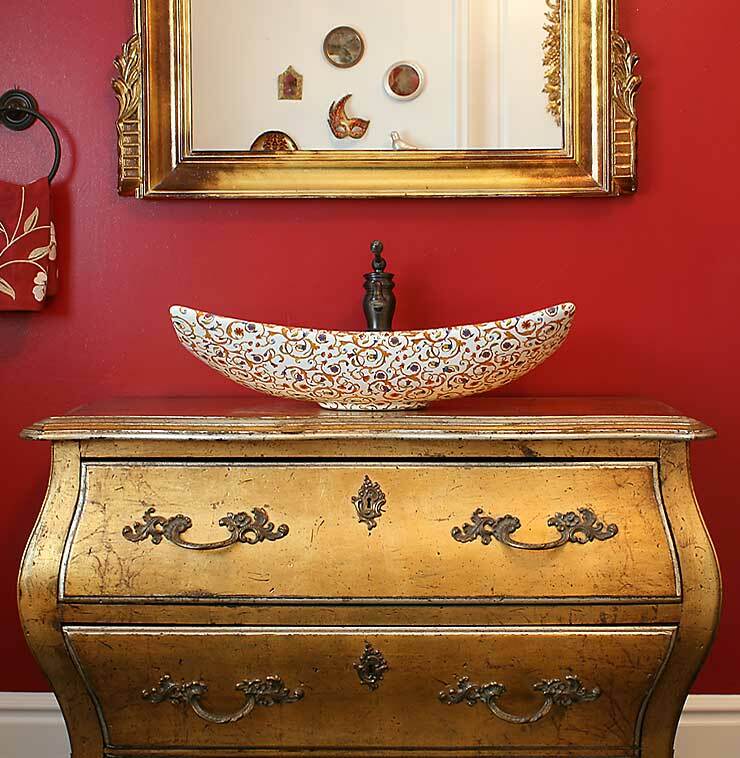 Florentine design painted on a biscuit vessel basin in red and gold bathroom. 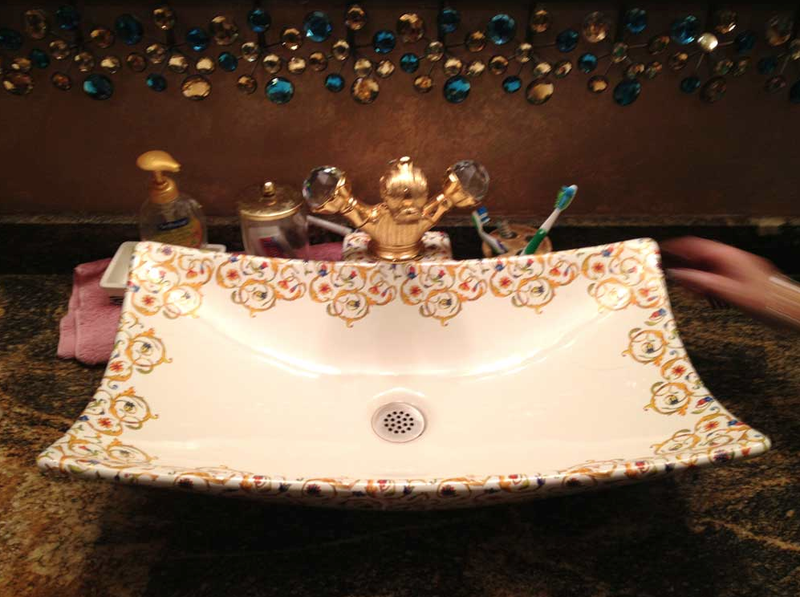 One last photo, a funny one, a customer shot of their Florentine sink in the bathroom. I especially love her hand trying to get the toothbrushes out of the way! It looks great with the swan faucet and the gold and blue glass-framed mirror. Thanks to my customer Linda for letting me into their master bathroom to take the photo. They were a local customer and we liked each other and she invited me to a party at her super-cool house. Seriously old-Vegas with a sunken living room and a bar and murals on the wall.